ENGLEWOOD – The only things missing were TMZ and the paparazzi. 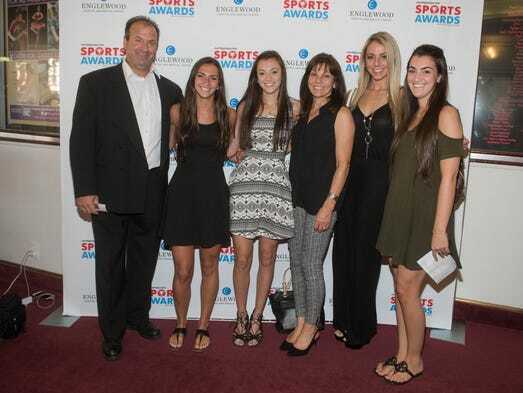 On Thursday, The Record and NorthJersey.com literally rolled out the red carpet to honor our area’s best high school athletes at the North Jersey Sports Awards at Bergen Performing Arts Center. The event was presented by Englewood Hospital and Medical Center, and also sponsored by Garden State Honda. One of the biggest winners was Michelle Sidor, who took home the overall Girls Athlete of the Year award. Saddle River Day’s star basketball player became the first junior in Bergen County history to surpass 2,000 points in her career. Also nominated were Monica Hebner of Northern Highlands and Jenna Rogers of Rutherford. David Estevez was named overall Boys Athlete of the Year. The River Dell quarterback led his team to seven comeback victories this past season. Also nominated were Ronald Harper Jr. of Don Bosco and Luis Peralta of Passaic. The Record’s Athletes of the Week for the fall, winter and spring seasons were on hand and celebrated during the show as well. This year’s recipients of the Charlie McGill Scholarship Award were Riley Babbitt of West Milford and Ryan Scully of River Dell. “I’m not all dressed up for you but for the young lady who’s waiting for me as her prom date,” Scully said to great laughter. The McGill Award is presented each year to two outstanding students who are an inspiration to the community and have exhibited sportsmanship, scholarship and citizenship. 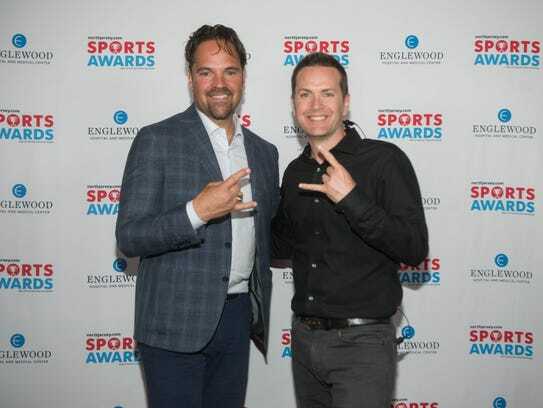 Piazza said he actually lived in Cresskill for two years during his playing career and talked about the fact that none of his own young children ever saw him play. Piazza echoed the thoughts of many of the award winners, who gave thanks to their parents. 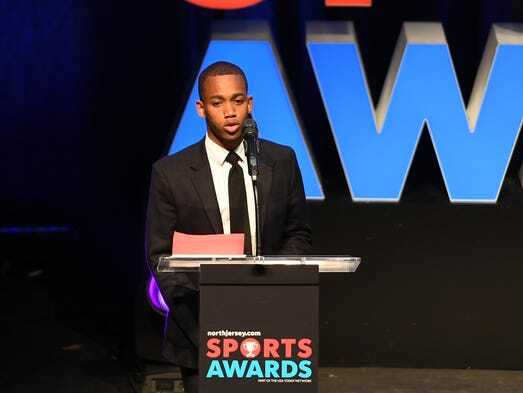 Matthew Rypkema of Waldwick won the I AM Sport Award, which honors high school student-athletes who are committed to giving back to the youth in their communities. Rypkema, who had a severe case of arrhythmia, became an advocate for heart screenings and raising awareness of sudden cardiac arrest and sudden cardiac deaths in youths. Also nominated were Madison Phillips of Wayne Valley and Connor Tsikitas of St. Joseph Regional. Glen Rock softball player Ellen Fuess was the recipient of the Courage Award. Fuess, who suffered a concussion when she fell into the metal bleachers as she was catching a foul ball, made it back to the field just three weeks later. Girls Cross Country: Monica Hebner (Northern Highlands); Boys Cross Country: Luis Peralta (Passaic); Gymnastics: Faith Furletti (Holy Angels); Girls Soccer: Erin Wilson (Westwood); Boys Soccer: Carlo Gonzalez (Pompton Lakes). Girls Tennis: Ashley Hess (Holy Angels); Field Hockey (Jane Pless); Girls Volleyball: Julia Morris (IHA); Football Defensive Player: Vinny DePalma (DePaul); Football Offensive Player: David Estevez (River Dell). Girls Swimming: Elle Morse (Leonia/Palisades Park); Boys Swimming: Tim Park (NV/Demarest); Girls Bowling: Victoria Vucak (Paramus Catholic); Boys Bowling: Jordan Tse (NV/Demarest); Girls Indoor Track: Grace O’Shea (Ramapo); Boys Indoor Track: Tyler Hrbek (NV/Old Tappan). Ice Hockey: Mickey Burns (Don Bosco); Wrestling: Mickey O’Malley (Hasbrouck Heights); Girls Basketball: Michelle Sidor (Saddle River Day); Boys Basketball: Ronald Harper Jr. (Don Bosco); Boys Volleyball: Connor Field (Lakeland). Girls Golf: Kelly Sim (Holy Angels); Boys Golf: Robert McHugh (Wayne Hills); Boys Tennis: Chikaya Sato (Cresskill); Girls Lacrosse: Michaela McMahon (Saddle River Day); Boys Lacrosse: Max Paparozzi (Northern Highlands). Softball Pitcher: Victoria Sebastian (Ramsey), Softball Player: Samantha Settecasi (Paramus); Baseball Pitcher: Ryan Ramsey (Pascack Hills); Baseball Player: Daniel Helfgott (Don Bosco); Girls Track: Caroline O’Sullivan (NV/Old Tappan); Girls Field: Tiffany Bautista (Paramus Catholic); Boys Track: Wellington Ventura (Cresskill); Boys Field: Jadon Watson (Kennedy). The Pascack Hills baseball team, which won its first Bergen County title since 1987, took home the honor. Also nominated were the Bergen Catholic football team and the Northern Highlands hockey team. Jeff Jasper, Pascack Valley’s girls basketball coach was named Coach of the Year. Jasper became the first girls basketball coach to win 1,000 games. Also nominated were Maria Nolan of IHA and Brian Dunn of NV/Old Tappan. Jasper sent “shout outs” to his assistant coaches and wife Lois, who he said has “stayed with me through all this and been to every one of the 1,000 games.” Jasper also sent his best wishes to the family of Bergen County basketball legend Anne Donovan, who passed away on Tuesday. He also shared the award.